Movie Review: American film director, producer, screenwriter, and actor, Jon Favreau, leaves the adventurous sci-fi genre behind (“Zathura: a Space Adventure”, a couple of “Iron Man”, and “Cowboys & Aliens”) to bring us an assertive feel-good comedy with lots of food, social media, and good disposition. When preparing to receive the visit of a successful food critic, prestigious chef Carl Casper tries to innovate in the L.A. restaurant he works for ten years by changing the whole menu. However, his long- time boss disagrees and persuades him to cook the same old menu. The reviews ended up being a flop and Carl challenges the critic for the second time via Twitter (becoming an online celebrity for the worst reasons), but again his boss gets in his way, making Carl quit without regrets. Frustrated and out of job, Carl moves to Miami, returning to the old times when he drove a food truck throughout the streets. He will also get the opportunity to better know his only son and reconnect with his ex-wife. 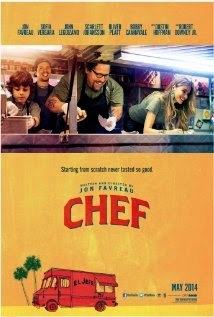 Despite some stereotypes and a bit of sentimentality regarding the family matters, “Chef” puts some charm and soul, not only in the yummy dishes that presents but also in the character of a cook who loves what he does, never giving up and finally making peace with life in general. It’s the sort of predictable film that, nevertheless becomes much more engaging and genuine than other comedies that rely on gross gags and idiotic situations. To simplify: it's imperfect but articulated.